On Friday, Senate Majority Leader Mitch McConnell announced that the Senate likely had enough people on their side to vote on a Republican tax reform bill. Way beyond a lot of other issues that come up in politics, tax reform is so confusing. It can be tough to figure what exactly you need to know about the current bill and how it’s all going to affect you. And if it’s confusing, don’t feel bad — this bill is a mess even for the experts and people who follow this news on the daily. But this time around, the conversation around tax reform seems to be purposefully confusing. Since the Senate is voting on a bill that they haven’t even released the text of yet to the public, all we’re going on is what senators are sharing in the media, past drafts of the bill, and what we know about the House tax reform bill that was approved earlier this month. The GOP likes it this way, since there are a ton of things they’re trying to slip through with this particular bill. Unfortunately, unlike health care or undocumented minors, this tax reform is all about making the rich get richer, which doesn’t elicit the same amount of compassion from some of the Republican senators who flipped and voted against their party on those other issues. So even though most experts agree that, in the long run, this tax reform bill will continue to hurt the middle class and simply be good for big business, a lot of Republican senators are still backing it. And they’re making deals to help it thrive behind closed doors, bringing the bill to vote without hearings or any open discussion. Even if the Senate passes the tax bill on Friday, it will have to be merged with the House tax reform bill, so a lot can change before it hits the Oval Office for Trump to sign. This means there’s still time to figure out what this tax reform bill is all about and call your congresspeople and beg them not to go for it. If not for your money, but simply because you don’t want to be able to see Paul Ryan, McConnell, and Trump gloat about getting legislation passed in this way. 1Either way, this bill is not great for most Americans. So all of the back-room dealing this week about getting enough Republicans on board to vote for the Tax Cuts and Jobs Act had to do with the fact that this bill would eventually increase the deficit by a trillion dollars. So Republican senators were holding out for some things that they wanted that they thought would help pay for the bill, since you can’t cut the amount of taxes people and corporations pay and expect the nation’s debt to not grow. It’s like when you spend too much money over the weekend and then go searching through your checking account balance looking for mistakes — you can’t just get that money back once it’s gone. The Joint Committee on Taxation, the Congressional office that runs the numbers on tax bills, released a statement on Thursday that said even if the tax bill increases growth by an estimated $408 billion (which apparently, it will), the national deficit will still grow by another $1 trillion in 10 years. The deficit is not going to go away, so if they pass the tax reform bill, cuts will have to happen elsewhere, like social security or Medicare. 2Companies and wealthy people will pay less taxes. The Senate bill may or may not repeal the Alternative Minimum Tax (AMT), which was instated in 1969 as a way to ensure the richest people paid their taxes. According to CNN Money, it’s a huge source of revenue since it forced people and corporations to pay something after they realized that even with a ton of deductions, their tax bill was super high. It saves corporations money and brings in revenue, so this will likely be a sticking point in debates later on. Tax rates under this bill would be lowered across the board, with big corporations getting a reduction from 35 percent to 20 percent. That’s a lot money for big businesses that make billions of dollars. The tax rate reductions for corporations would be permanent, while the reductions for regular people would expire by 2025, which is just another way a lot of people feel the GOP is showing that they care more about companies than actual people. There are also provisions in the bill that would allow companies to bring their money back from tax havens and not pay any taxes on it, while also exempting wealthy people from the estate tax. So people who inherit loads of money don’t pay taxes on it. Most of the reforms for companies and small businesses are intended to “create jobs,” but everyone knows that cash never “trickles down,” even the guy who helped Ronald Reagan create the theory, so don’t believe the hype. 3But regular people will be able to deduct a lot less. Republicans have been rewriting this horrible tax plan behind closed doors, but they're still keen to rush a vote on it today. How reckless. I hope you’ve been making those calls. A lot of these things can change while the Senate negotiates with the House, but some proposed things in the bill include: no longer being able to take a personal exemption (although the child care credit will possibly be expanded). There are also a lot of tiny items, like not being able to deduct interest on a home equity loan, riding your bike, or tax prep costs; The bill just generally reduces what you can itemize, which is bad for single people, young workers, and middle-class families. I thought Republicans were opposed to deficits. Your #TaxScamBill proves you are just lying tax and spend Republicans, adding $1 trillion to the federal deficit and a huge burden on our children's future. Both the House and Senate bills would eliminate the state and local tax deduction (SALT), which lets people write off their property taxes and other municipal bills. A lot of cities and towns are worried that this will get in the way of raising their own taxes, meaning that local school districts, public transportation, infrastructure and road maintenance, libraries, and all the things your town pays for will suffer. Maine Sen. Susan Collins bargained for at least some SALT deduction, which is what got her on board Friday for the vote, so this could be another sticking point for the debate later on. 4They’re shoving in non-tax related things, too. UPDATE: We still haven’t seen the text of the tax bill Republicans are scrambling to rewrite in secret. I’d imagine some Republican Senators haven’t either. Our constituents didn’t send us here to govern this way. The Senate bill would repeal the individual mandate for the Affordable Care Act, which is related to taxes — that’s the part where you have to show you’re insured or else you pay a penalty. The GOP will gut that, which the Congressional Budget Office says will cause premiums to rise about 10 percent every year and cause 4 million to drop their insurance by 2019, and 13 million by 2027. Inexplicably, there’s also a line item about allowing oil drilling in Alaska’s Arctic National Wildlife Refuge, in addition to, at least in the House bill, a provision to allow people to save for an “unborn child’s college,” thus somehow defining life in a tax reform bill. 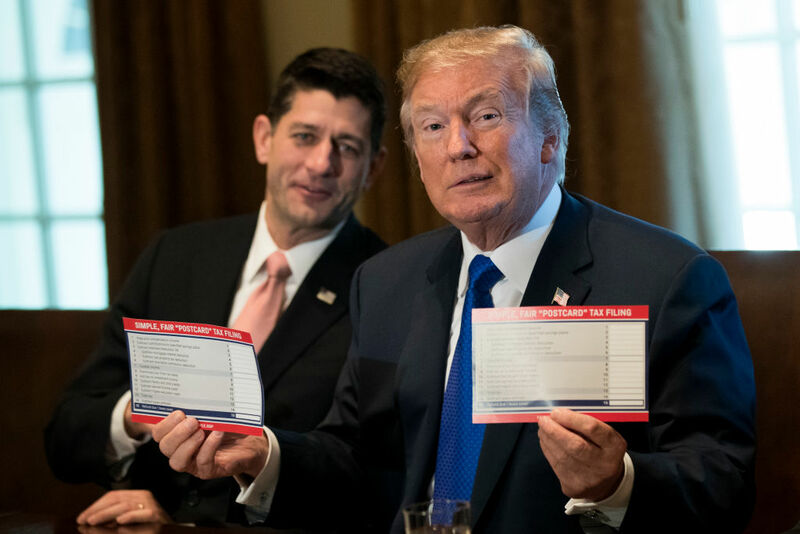 This tax reform bill is not just imperfect, it’s old school GOP lunacy in which they sell tax breaks for corporations and the wealthy in the name of “creating jobs.” In reality, this bill hurts regular families, depletes social services in cities and towns, and would somehow also gut Obamacare. If you have feelings about any or all of that, it’s a good time to get in touch with your congressional reps and let them know.